Some numbers to help you get ready for tonight's Eagles-Cowboys game at the Linc. 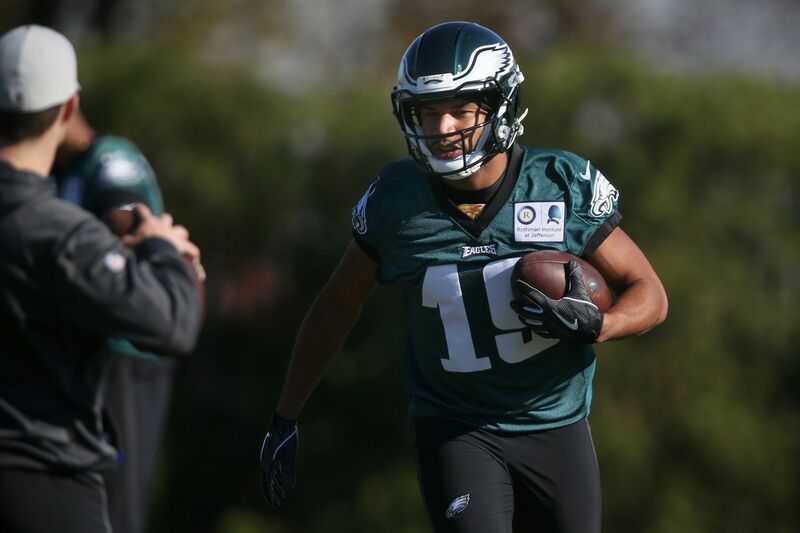 — Since 2014, new Eagles wide receiver Golden Tate has 124 third-down receptions. Only Steelers All-Pro Antonio Brown has more during that period – 136. Tate has 44 receptions this season, including 15 on third down. That ties him for the eighth most in the league. Zach Ertz has 10. Alshon Jeffery and Nelson Agholor each have nine. — Tate's 416 receptions in the last five years is the seventh most in the league, behind only Brown (523), Julio Jones (471), Jarvis Landry (456), Demaryius Thomas (429), DeAndre Hopkins (424) and Larry Fitzgerald (422). — Tate has a 69.8 catch percentage over the last five seasons. The only wide receiver with 300 or more receptions during that period that has a higher catch percentage is Tate's former Seattle teammate, Doug Baldwin (330 catches, 71.0 catch rate). — Carson Wentz ran his streak of consecutive games with at least one touchdown pass to 21 against Jacksonville. Wentz has thrown two or more TD passes in 16 of those 21 games. -Wentz has thrown 62 touchdown passes in 35 starts since making his NFL debut in 2016. That's the tenth most TD passes in the league over the last three seasons, behind Philip Rivers (80), Drew Brees (78), Tom Brady and Matt Ryan (both with 77), Ben Roethlisberger (76), Russell Wilson (73), Aaron Rodgers (71), Kirk Cousins (69) and Matthew Stafford (67). — He has 46 TD passes in the last two seasons, despite missing five starts. That's the sixth most in the league behind Wilson (52), Brady (49), Jared Goff (48) and Rivers and Roethlisberger (47). — Wentz has averaged a TD pass every 14.4 attempts the last two seasons. The only quarterback with 400 or more attempts who has a better TD percentage the last two years is Houston's DeShaun Watson, who has averaged one every 13.6 attempts. The Chiefs' Patrick Mahomes is averaging a TD every 12.1 attempts, but has just 352 attempts (Wentz has 665). — While Wentz's overall passer rating this season (109.6) is better than last year (101.9) when he was the leader in the MVP race before injuring his knee in Week 13, his all-important situational numbers are down. His third-down passer rating (99.1) is nearly 25 points lower than last year (123.7). Last year, 50 percent of his third-down pass attempts resulted in first downs. So far this year, just 44.6 percent. — Wentz had a league-best 133.0 passer rating last year on third-and-long (eight yards or more). This year, he is 16th (89.0). He averaged 11.6 yards per attempt on third-and-eight-plus throws last year. This year: 6.3. — Wentz already has been sacked six times this season on 62 third-down pass plays (once every 10.3 plays). Last year, he was sacked seven times all season on 131 third-down pass plays (once every 18.7). — Wentz also hasn't been as effective in the red zone. Last season, he led the league in red-zone passing with a 116.0 rating. Completed 64.9 percent of his passes inside the 20 and didn't have an interception or was sacked. So far this season, he has a 62.7 red-zone completion percentage, and while he hasn't thrown an interception in the red zone, he's been sacked three times in the last four games. — In his first six starts, 16.5 percent of Wentz's pass attempts, not including throwaways and batted passes, have been thrown behind the line of scrimmage. That's up from 12.4 percent last season. He doesn't have an incompletion yet on 36 throws behind the line of scrimmage. — Wentz hasn't thrown deep as much this season so far. Just 11.9 percent of his attempts have been throws of 20-plus yards, compared to 15.5 percent last year. — When Wentz has thrown deep, he's been more accurate. He has a 50.0 completion percentage (13-for-26, and 8-for-14 in the last three games), compared to just 33.8 last year and 31.3 as a rookie. — The Eagles are second in the NFL in run defense, allowing just 83.8 yards per game on the ground. But that number is a bit misleading. One of the reasons it's so low is because teams haven't been running on them. They are averaging the fewest opponent rushing attempts per game (18.1). Five of their first eight opponents have run the ball no more than 18 times against them. That is likely to change Sunday night when they face Ezekiel Elliott and the Cowboys. Elliott is fourth in the league in rushing with 680 yards. The Cowboys are averaging 26.6 rushing attempts per game. — The Eagles are 21st in opponent rush average, allowing 4.5 yards per carry. They've given up 120 or more rushing yards in two of their last three games. — Two hundred twenty-one of the 670 rushing yards the Eagles have allowed this season, or 33 percent, have been on the first four carries of the game. Opponents are averaging 6.9 yards per carry on their first four rushing attempts, and just 3.8 after that. — In their last five games, 30 of the 96 rushing attempts against the Eagles have been by quarterbacks. The Panthers' Cam Newton, the Titans' Marcus Mariota and the Jaguars' Blake Bortles combined for 138 yards and eight first downs on 25 carries. Cowboys quarterback Dak Prescott also is a running threat. He's averaging 5.9 yards per carry on 42 rushing attempts and has 16 rushing first downs, which is the fifth most in the league among quarterbacks, behind only Newton, Bortles, Mariota and the Bears Mitch Trubisky. — This will be the third time the Eagles have faced Elliott. He rushed for 96 yards on 22 carries in a 29-23 win as a rookie in 2016, and had 103 yards on 27 carries last year in the Cowboys' meaningless 6-0 Week 17 win when the Eagles rested many of their regulars. — Elliott has averaged just 3.3 yards per carry in the Cowboys' last four games, and only 2.9 in the last two. He had averaged 5.8 yards per carry in the Cowboys' first four games. — The Cowboys are averaging 5.2 yards per carry on first down, which is the fifth best first-down rushing average in the league. The Eagles are 21st in opponent first-down rush average (4.51). They were first last year (3.37). — The Eagles have allowed just 18 runs of 10 yards or more, which is the second fewest in the league. Six of those 18 runs have been by quarterbacks. — The Eagles are tied for 25th in turnover differential (minus-5). They have just seven takeaways. That's the fourth fewest in the league behind only the 49ers (5), Raiders (6) and Bucs (also 6). The combined record of those three teams is 6-19. — Just one of the 24 teams that qualified for the playoffs the last two seasons had a turnover differential lower than minus-4. That was the 2016 Houston Texans (minus-7). The average turnover differential of playoff teams the last two years: plus-5.5. The Eagles had a plus-11 turnover differential last season. — The Eagles have just 28 rushing first downs in their last five games. That's tied for the eighth fewest in the league during that period. Five of them were by Jay Ajayi, who is out for the season. Seven belong to quarterback Carson Wentz. And one other was by wide receiver Nelson Agholor. — The Eagles' average touchdown drive this season has been 70.8 yards. Last year, it was 61.9. That's primarily a result of the lack of takeaways this season (7 in 8 games). Their average drive start this season is the 26.0 yard line. Last year it was the 30. They've started at their 40 or better just 13 times in eight games. Last year, they started 43 drives at the 40 or better. — Alshon Jeffery has 29 receptions on 44 targets for a 65.9 catch percentage. That's the highest of his career. His previous high was 60.1 in 2013 with the Bears. Zach Ertz has a 72.6 catch percentage (61 receptions on 84 targets). That's the second highest of his career. He had a 73.6 catch rate in 2016. — Ertz is tied for fourth in the league in receptions. His 61 catches are the most among NFL tight ends. The Chiefs' Travis Kelce is second with 51.